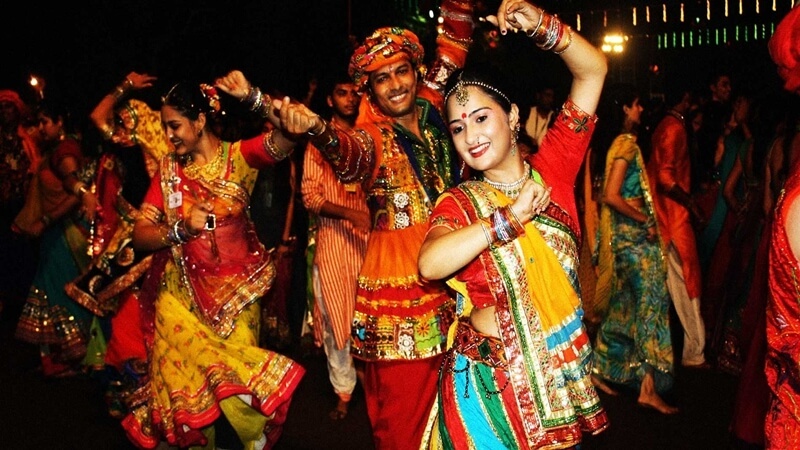 The Top 10 Dandiya Events in Bangalore this Navratri! 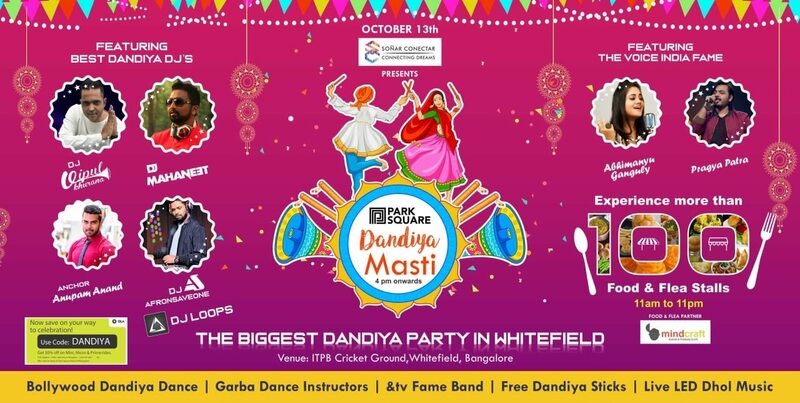 The nine magical nights of Navratri are just around the corner, and Bangalore is all set to celebrate with glorious Dandiya events- are you? You do not want to miss out on the festive cheer. So we have handpicked ten of the best events happening in the city. Hit them up to have a total blast! 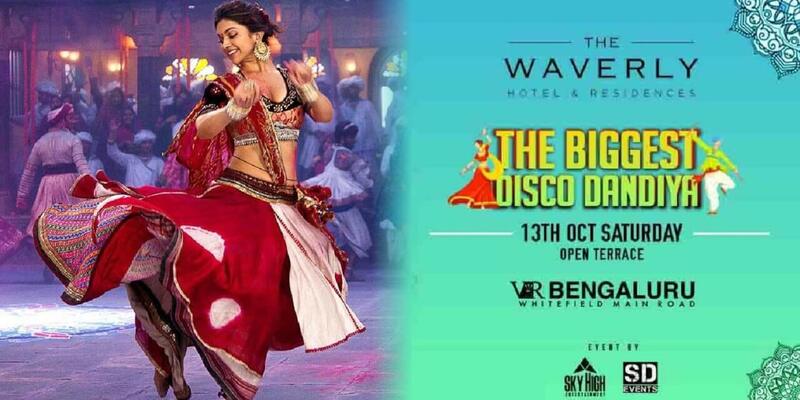 The dhol will beat all night long, the garba performances will be a sight to sore eyes, the 14 DJ lineup will keep you dancing all night long- but if you’ve got an issue with space and comfort, look no further, because the Dandiya Utsav Edition 3 brings with it, three extravagant dancefloors- want to make a legitimate show out of those magnificent Dandiya moves? Here’s your best bet. 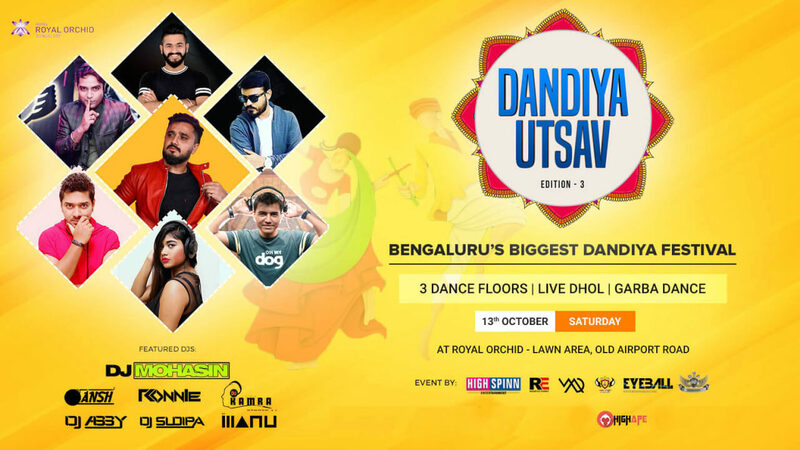 This open-air, poolside Disco Dandiya has a lineup of Bangalore’s most wanted DJ’s. An MC to keep it light and lively, F&B starting at 99 INR only, Boliyan singers, dhol and garba performers, even a play area for the kids- and of course non stop Dandiya dance-offs! this event has ~extra~ written all over it! Why: Poolside, open-air venue; play area for kids; games and activities for patrons of all ages. A good Dandiya event at a field spins the tale of a fabulous evening, brings back memories of neighbourhood Dandiya nights we danced at, as children. A flea market, food trucks, and stalls, Dandiya competitions, contests for the best- dressed and more, all packaged into one beautiful day. This star-studded event has a power-packed DJ lineup, and live performances by Pragya Patra and Abhimanyu Ganguly, of The Voice of India fame. Grab your chance to indulge in a little meet and greet with celebrities. Here’s your chance to live the fairy tale life- deck up in the long, flowy skirts, put on your dancing shoes and spin to some magical music, all at an alluring garden: the charming lawns of the Lalit Ashok. The event also comes with a beautiful stage set-up, LED walls, sound and lights- oh, and don’t forget to bag the free goodies! A good old-fashioned Dandiya Night, but the club style! The beats of the dhol will beat all night long, but the super talented DJ Ankush will make you dance with his electrifying mixes. Old meets new- and it is bound to bring the roof down! 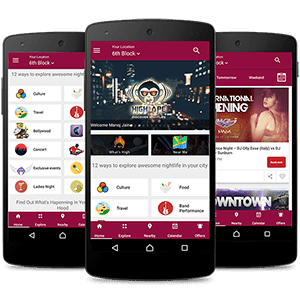 With Dandiya giving the nightlife scene a makeover, the city’s all-time favourite Punjabi nights are bound to take the backseat for a while. 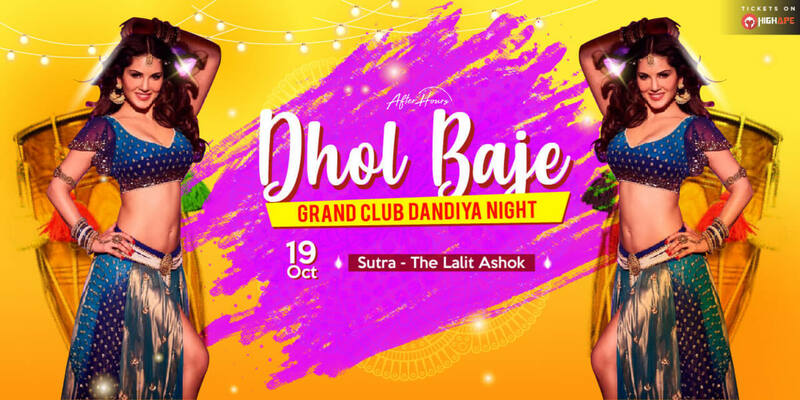 If you can’t get enough of the Punjabi tadka- this event is for you, a Dandiya night spiced up by the Punjabi mixes, a combination you can’t say no to! 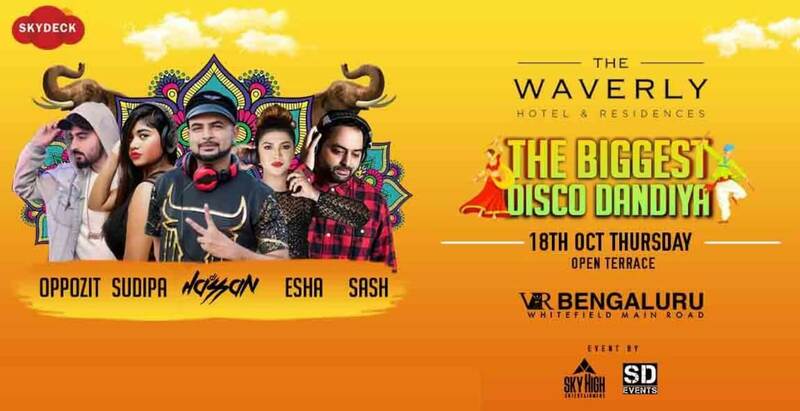 A poolside, rooftop Disco Dandiya with 7 hours of non-stop music, live dhol performances, F&B counters, a lineup of 4 fantastic DJ’s- all at an elegant 5-star venue. A Dandiya Night cannot get better than this! 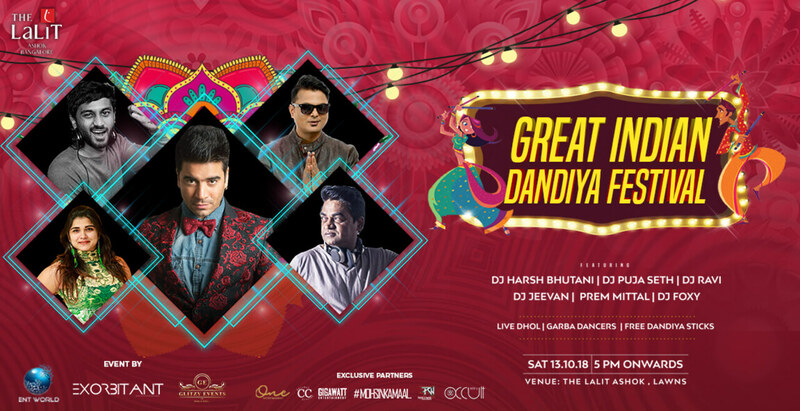 If you want a Dandiya night that is larger than life and extraordinary- here’s one tailored just to match your fancies: an MC, the Nagada Dhol, Garba and the Dandiya Raas, food trucks, an exciting lineup of 5 DJ’s! That’s not all: a poolside party at an open-air rooftop venue, F&B for the adults, play area and games for the kids. This event has got something for everyone! Bollywood is an immediate mood lightener, it adds glamour and glitter to the elegant. 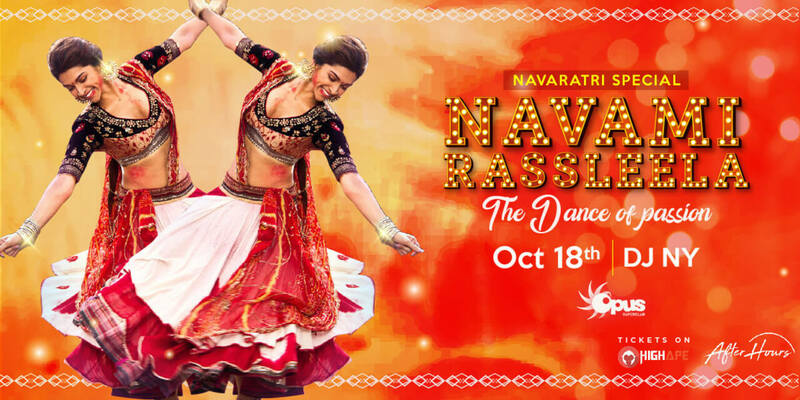 This Dandiya season, should you ever fall short of the glam and crave dancing to good old Bom Diggy Diggy and Kar Gayi Chull- the Navami Rass Leela is here to take care of your party needs! 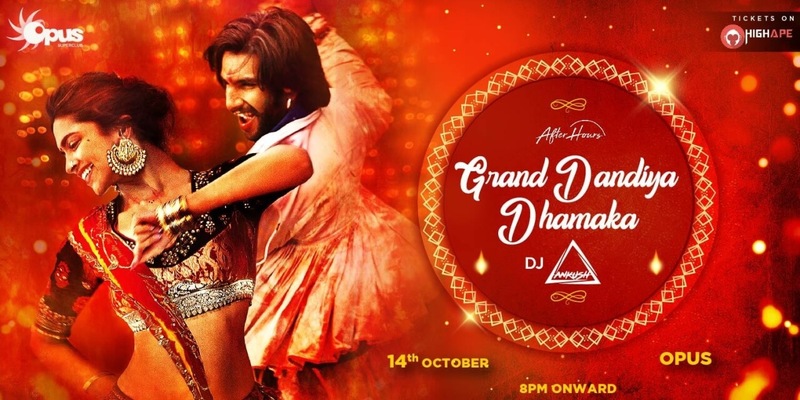 Why: Upgraded Dandiya night with electrifying Bollywood mixes- ‘nuff said! The Navratri season is incomplete without some bomb selfies and crazy boomerang ghagra twirls. What better a Dandiya Night than one at the gorgeous, Sutra- The Lalit Ashok to set the perfect lighting and mood for your Instagram spam? Why: The chic cocktails; Lalit Ashok’s lighting and decor for on-fleek selfies? Yaaas. Have a helluva Navratri, you can thank us later!